GREENVILLE, N.C. (Jan. 9, 2018) – The results are in! The third annual Readers’ Choice Product of the Year awards from Materials Handling Product News (MHPN) have come to a close, recognizing winners across 13 categories that drive greater performance in supply chain operations. The Yale® MC10-15 counterbalanced stacker Driven by Balyo came out on top in the automated guided vehicles (AGV) category, and the direct-store delivery (DSD) package for the Yale® MPB045-VG walkie pallet truck won in the lift trucks and accessories category. 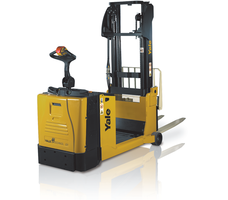 About Yale Materials Handling Corporation Yale Materials Handling Corporation markets a full line of materials handling lift truck products and services, including electric, gas, LP-gas and diesel powered lift trucks; narrow aisle, very narrow aisle and motorized hand trucks. Yale has a comprehensive service offering including Yale Vision wireless asset management, fleet management, Yale service, parts, financing and training. Yale® trucks are manufactured in an ISO 9001:2008 registered facility and range in capacity from 2,000 to 36,000 lbs.